Are you one of the crazy people doing real, live Black Friday shopping today? I prefer to sit in the warm comfort of my own home and shop online or shop among other humans any other day except Black Friday. If you’re the same, scroll through this list because some of these items are on KILLER Black Friday sales today online and I don’t want you to miss them! Nothing sponsored on here, just things I love, love, love. There are affiliate links for Amazon products scattered below if I’ve bought the product from there, but as always, feel free to shop around! 1. Waffle Cone Maker. Such a fun little tool, especially if one loves waffle cones as much as I do. I generally stay away from one-task only appliances, but we make waffle cones right and left because of this, and I love, love, love it (I have perfected the almighty waffle cone if anyone wants the recipe) – plus, it makes my house smell like no candle every could. 2. Little black knife. I have used many a high-end knife (I’ll give a recommendation for my favorite one below that’s actually worth it), but there’s something to be said for this powerhouse, inexpensive knife. It’s stayed sharp for over a year and I pull it out all the time (it’s the go-to knife for my kids to use, also); it really is the perfect, little knife. This would make a perfect, albeit slightly dangerous, stocking stuffer. 3. Kilner Honey Pot. Adorable and functional, this honey pot and accompanying dipper makes me smile every time I open the cupboard and see it. Because I buy honey in bulk, it’s perfect to portion some into this cute jar so we can use it on the daily without digging into our big bucket o’ honey. Honey pots are the new honey bear, didn’t you know? 4. USA Bread Pans. I’ve had a favorite bread pan for years (the Chicago Metallic brand) but I have to say, there’s a new kid in town when it comes to bread pans. My cousin-in-law, Julianne, told me about the USA brand long ago, and I’m finally converted. I looooove these bread pans. Nothing sticks, bread bakes evenly; they are wonderful. 5. Wilton 48-Cup Mini Muffin Pan. Do you remember when I told you about this mini muffin pan on steroids? It’s been a while, and I used to only see these hit and miss at Target, but it seems the popularity has caught on. You can catch the dark, nonstick version on Amazon (works best to bake 25 degrees lower because of the dark coating) or the lighter coated pan at Bed, Bath and Beyond (this is the one I have). 6. New West Knives. I’ve gone the rounds on investing in good-quality, higher-end knives, and I’ve finally committed. I can’t say enough about the New West Knifeworks Company and Knives. I’ve had the Santoku knife for several years now. It is amazing – high quality and a dream to chop with. I recently bought the smaller Fusion Chopper, and other than that black knife I talked about above, I may never use another knife again. Bonus?? All the knives at New West are on sale! Sweet. 8. In-Drawer Bamboo Knife Block. I love storing my knives in the drawer in my island where I can easily access them. This bamboo knife block that sits right in the drawer keeps the blades safe and secure and the knives organized. I almost wept with the joy the day I got it and saw how clean and well-kept my knives looked. 9. Great Food Fast. The best pressure cooker book on the market, in my opinion. I’ve made a lot of recipes in this book – all delicious! 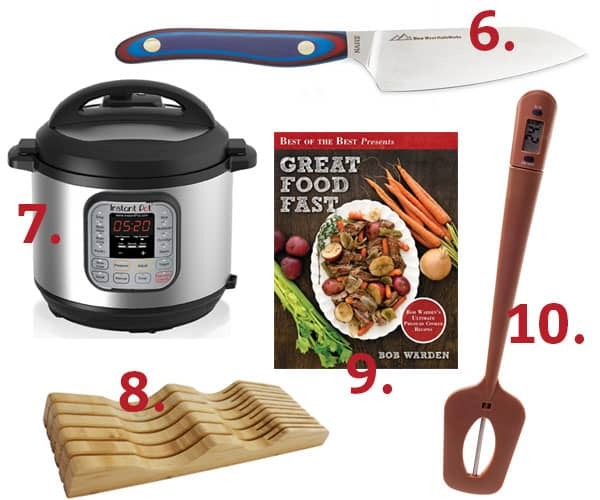 A perfect gift for the pressure cooker lover in your life. 10. Candy Thermometer Spatula. The good news is this candy thermometer in spatula form is awesome. The bad news is it is no longer available on Amazon (where I bought mine). But keep it on your wish list or search for it elsewhere online, because it makes candy-making a breeze. 11. OXO Good Scraper/Chopper. I very well may have suggested this handy bench scraper before, but here I am talking about it again, because it is awesome. One of my very favorite kitchen tools. I use it for slicing bread dough/rolls into portions, cutting cinnamon rolls, dicing some vegetables, scraping up a dirty workspace. I’ve given it as gifts so many times and kind of wish I had two in my drawer – it’s that wonderful. 12. Iwatani Cooking Torch. If you’re ready to take your cooking game up a notch (or help someone else through a gift), this is THE cooking torch to get. Surprisingly, I use it all the time, not just for creme brûlée and the like (although it’s perfect for that). We toast marshmallows for quick s’mores, blister peppers for roasted pepper flavor, and we’ve been known to light birthday candles with it when we were out of matches, among other things. Every time I pull this out, I feel instantly cool. 13. Zyliss Stainless Steel Potato Masher. If potato mashers could talk, this beautiful tool would tell you how much I adore it. I had to replace my 14-year old potato masher (which was kind of a piece of junk I dealt with over a decade) a few months ago, and am crying myself to sleep that I waited this long. The design and functionality of this little potato masher is spot on perfect. 14. Kitchenaid Kitchen Scissors. Everyone needs a heavy-duty, functional pair of kitchen shears that are off limits to making crafts, cutting hair, or repairing household plumbing. These are the kitchen scissors I have and love (and have been known to get very irate when they’ve been confiscated for any of the above projects). 15. Portmeiron White Platter/Cake Plate. This beautiful white platter/cake plate has just enough unique charm to get compliments wherever I take it. I most often use it as a cake plate or for cookies and brownies. It’s one of my favorite serving pieces. 1. Digital Picture Frame. 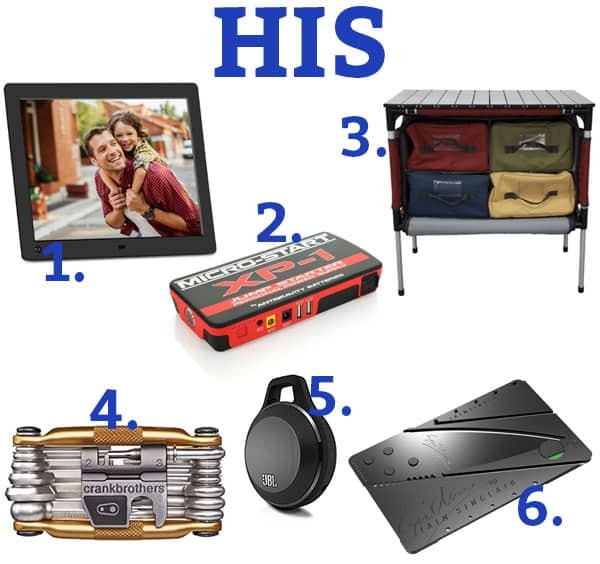 Ok, obviously this would work for guys or gals, but I snuck it right here on the gift guide. Digital picture frames are so fun; I love going to my parent’s house and seeing theirs (this one!) up and running with hundreds of pictures. We watch it over and over and over. 3. Sherpa Outdoor Table. I always feel like I want to declare a favorite gift on each gift guide, and this Sherpa table would definitely be The One this year. I can’t even tell you how much I love this outdoor table. We’ve taken it to the hills when we’ve gone 4-wheeling and RZR-ing for our food stuffs, and we’ve used it countless times just in our backyard. The cooler drawers are so functional and handy – and one of them is seamless so it can double as a sink or for liquids. It’s available at a super low price on Amazon (way cheaper than when I bought it for a gift last month) or directly from the Camp Chef website. 4. Bike Tool. Well hello, perfect stocking stuffer! This multi-functional bike tool is awesome. Brian’s already used his on a 22-mile scout bike ride (it has a universal chain tool + screwdrivers + spoke wrenches, among other things). It almost makes me want to go on a 22-mile bike ride. Almost. 5. JBL Clip Speaker. This bluetooth speaker that clips on just about anywhere is a great gift and one we use all the time (in the car, boosting sound on phones and iPad in the house, and working around our property because music makes shoveling dirt more fun, right?). 6. Credit Card Knife. My brother gave Brian one of these knives ages ago and Brian accidentally left it in his wallet going through airport security a year or so ago (major oops!). This last year for Father’s Day, we gave him a new one, and it made him very happy. You’d be surprised how often this cool little gadget comes in handy (talk about the perfect tool for Christmas morning present opening!). 1. Essential Oil Necklace. I’m not a huge jewelry wearer, but I’ve been wearing this diffuser necklace nonstop. Sometimes I even put a drop of essential oil in it. 🙂 Mostly, I just love the design, and aromatherapy diffuser necklaces are kind of a big deal right now. Speaking of necklaces, my sister gave me a necklace from this cute Etsy shop, and it’s another I wear regularly. So cute! 2. Burts Bees Lip Shimmer. My favorite lip gloss. Ever. EVER! I have the champagne color (and love it so much, I have a tube for every bag I own). 3. Codenames. I feel like such a game geek – I mean, I just did a big gift guide about games – so you know I really, really love games, if I’m including yet another on my “hers” list. This is probably one of my favorite games ever. It’s relatively new to us, but I can’t get enough. I love clue-type word games, and this Codenames game is the best one I’ve played like it. My family is getting sick of me wanting to play this all.the.time. (best played with teenagers or adults, although my kids are good sports). 4. Frye Slip On Sneakers. I’m no fashionista, but these are my favorite shoes (and have been the last couple months with slightly cooler weather). They are versatile, comfy, and high-quality. My 9-year old teases me that these are my “old shoes” because they come with that worn look…that’s one of the reasons I love ’em. 5. Coolibar Ruched Sweater. I’ve gushed about Coolibar swim clothes and hats (after my bout with skin cancer), but I am equally crazy about this ruched sweater, and I get compliments every time I wear it. It is comfortable, flattering, and so cute. I have it in midnight blue and recommend sizing down one size if you don’t want it overly big. 6. Letter Boards. I know the letter board trend has trended already, but I love mine and wanted to share. It sits on my mantel and I love being able to change the saying whenever I feel like it. The last time our golden retriever, Maggie, dug in our garden, Brian came home to the letter board reading “It’s either me or Maggie.” The sad part is his response: are you sure you want to know that answer? Hmmm. While millions of people brave crowds today, I’m blasting Pentatonix’s new Christmas album and setting up our Christmas tree. See you Monday! Hi Mel! Just wanted to let you know that I bought Code Names after reading your recommendation and my family had the BEST time playing it over the holidays! So fun! Also, I made your Lion House Rolls twice last month……….huge hit with everyone who eats them. Thank you!!!! Ok, better late than never! (Thanks Susan for reminding me…) For those that want the waffle cone recipe, here’s the one I’ve used with the BEST luck. It’s crispy and perfectly sweet without being overly so. Many other recipes I’ve tried have been kind of thick and dense. It’s worth it to whip the egg whites separately and fold them in…makes that texture absolutely perfect. In a medium bowl, whisk together flour, salt, and 3/4 cup powdered sugar. In a large bowl, using an electric mixer on medium-high speed, beat egg whites and remaining 2 tablespoons powdered sugar to stiff, fluffy peaks. Fold the dry ingredients into the egg white mixture until just blended. Fold in melted butter and mix until all is incorporated – don’t overmix. Heat a waffle cone maker according to manufacturer’s directions. Using 3 – 4 tablespoons batter per batch, make waffle cones one at a time, baking to desired doneness and molding them while still warm. 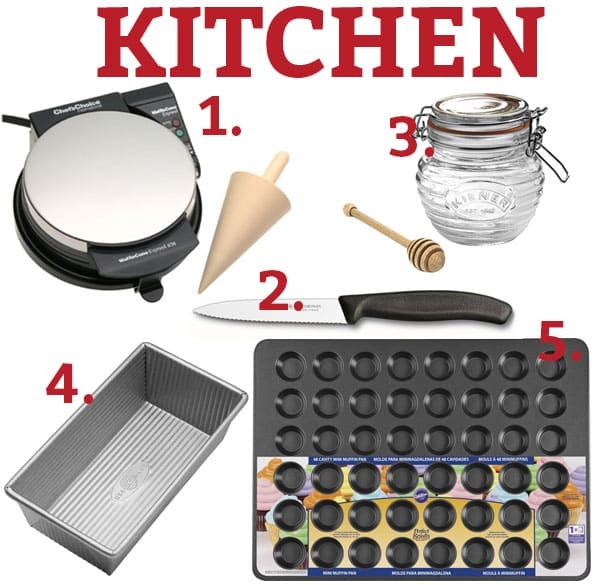 Echoing the requests that you post that waffle cone recipe – I ordered a waffle cone maker for my husband (okay…it might be more for both of us…) for Christmas, and I’m hoping to make them Christmas evening with homemade ice cream! I would LOVE your waffle cone recipe! Mel, I ordered the Iwatani Cooking Torch but I have a problem. It says to use the Iwatani butane canister with it and I cannot find it anywhere. Do you know where I can buy it or do you use another brand with this torch? I’ve bought it on Amazon but have also found it at Walmart. Thanks so much. I ordered this from Amazon and am looking forward to using it. Love reading Mels’s Kitchen cafe everyday!! 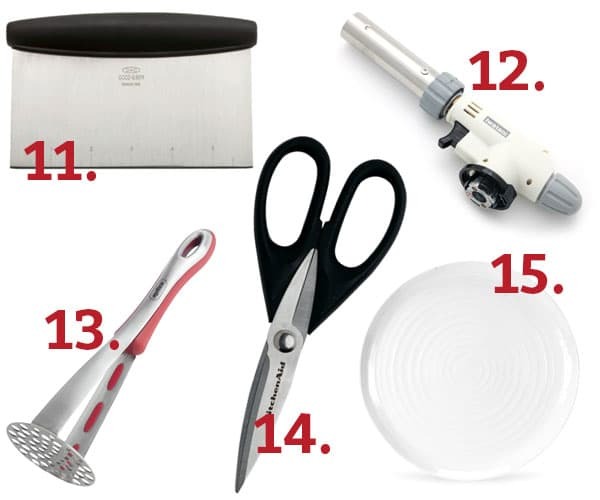 This may seem like a dumb question, but related to kitchen gadgets. I can’t find a good potato peeler! Apparently I’ve never used a “great” one, and my current peeler has been complained about by other family members. haha! Any recommendations would be great! Hey Lindsay – I have an old Pampered Chef one that I love, love…and I’ve also really liked the Zeal vegetable peeler I bought earlier this year. It fits right into my palm and I use it more than the other one now. LOVE your gift guides. The only problem is that I want to go and buy EVERYTHING that you recommend. 😉 Thanks, Mel!! I second your recommendation of ‘Great Food Fast’. If you have a pressure cooker, you need this book. If you don’t have a pressure cooker, get one! Then buy this book. Loved this article! It was great! I got some great ideas. The candy thermometer spatula is available on Amazon under a different brand. The letter board was interesting to me. I use an old scrabble game to leave messages on my hutch where I do seasonal displays. Its an old game with wood tiles and the wood letter holders. It looks retro and charming. and perfect for a scrabble fanatic. Is there a link to the UFO game? These are all great ideas! We totally need a good pair of kitchen scissors, and a good scraper. Is there anything worse than trying to chisel bread dough off your counter? I too love these lists. I just purchased the cookbook, Amazon has a code today for $10 off any $25 book purchase. Oh, please post the cone recipe and any tips. Thank you and Merry Christmas! I’ll post it tonight when my kiddos go to bed! 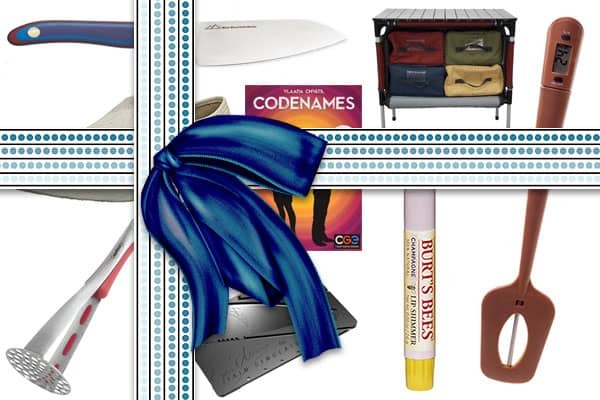 Oh, I’ve been waiting for this gift guide! The adults are always the hardest ones for me to buy for and these are fabulous ideas! Thanks, Mel! And thank you for all your wonderful recipes. I made 5 different pies from your site this week. Yum!!! We missed you too! I hope everyone is feeling better at your house! I love it, Jill! And am so grateful Em gave it to me. Mel, I am so thankful for you! You have inspired my cooking when I’m down and needing inspiration. 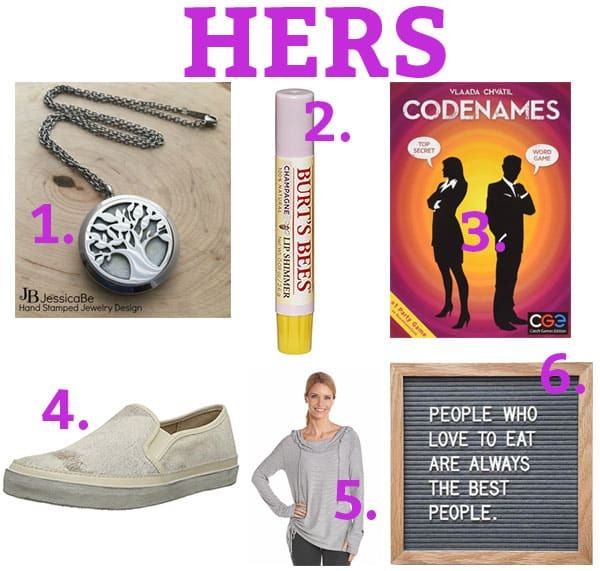 I also love, love, love your gift recommendations! You have helped me become a better gift giver to many who seem to have just about everything! My husband orders waffle cones by the dozen when we go places and eats them without anything in them… I am ordering the waffle cone maker today! I’d love your recipe when you get a chance! Thank you, thank you! Thanks, Lauren! Isn’t that handmade UFO game the best? Yes, it is! A huge crowd pleaser–guaranteed to bring oodles & oodles of laughter all around. Yes please on the waffle cone recipe! I’ve been looking for a good one. Thanks! I’ll add it to this comment thread later today! I’d love the recipe as well! Thanks so much! Thanks for the heads up on the Instant Pot Black Friday deal. I ordered one for myself for Christmas.You always put together the best gift guides! Yup -I ordered one too! Oh, and I picked up one of those spatula/thermometer combos a couple of months ago and will try it our next week as I start making candy for the holidays ! Mel, I love my stovetop pressure cooker, but I’ve been considering “upgrading” to an instant pot. Do you have any thoughts on whether it’s worth it based on your experience? Hey JaLeen – great question. I have a stovetop pressure cooker that I love as well…but have to say the Instant Pot is worth it in my opinion for the main reason that I can set it and forget it (vs having to keep an eye on my stovetop pressure cooker to make sure it doesn’t go below or above pressure). I’ve actually loved having both – I’m amazed at the nights I have rice cooking in the instant pot and beef stew in the stove top pressure cooker. I’m not sure if it makes a difference for you (or if you’re ready to make a decision now) but Instant Pot has extended that crazy good pricing of $68 for the 6-quart Instant Pot through today.